I’m stuck in my house because of snow and bored out of my mind. So what better time to try some new recipes I’ve always wanted to try? 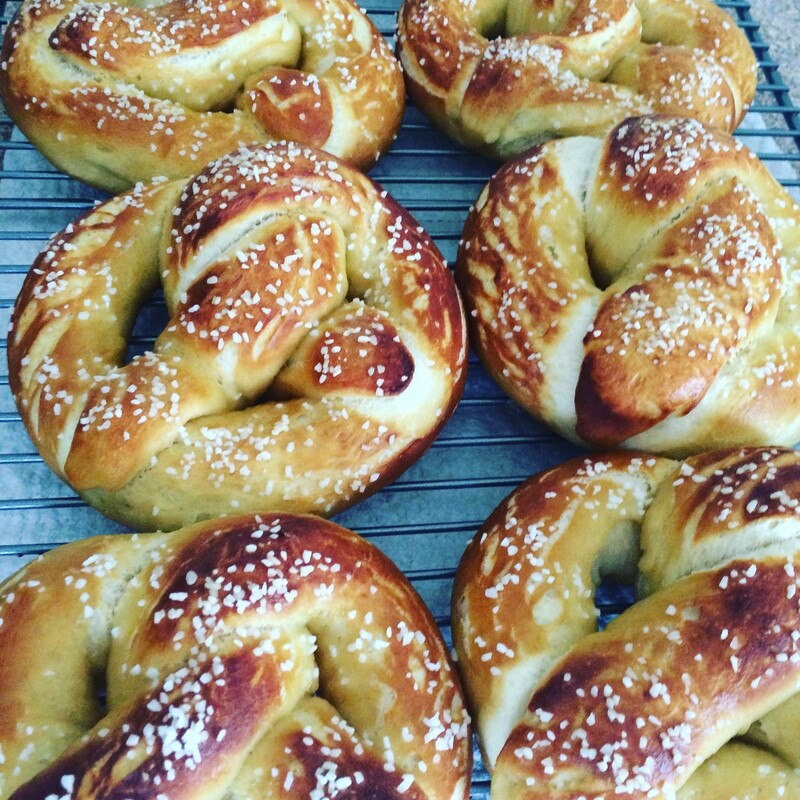 I’ve made bread and pizza doughs many times, but I’ve never attempted soft pretzels before. This recipe from Alton Brown has a ton of great reviews, and I see why. It’s perfect and surprisingly pretty easy. I didn’t change a thing. And they work perfect to slice in half for sandwiches. In the bowl of a stand mixer, add the water, sugar, kosher salt, and yeast. Let it sit for about 5 minutes, or until the mixture begins to foam. Add the flour and melted butter. Using the dough hook attachment, mix on low speed until well combined. Change to medium speed and knead until the dough is smooth and pulls cleanly away from the side of the bowl, approximately 5 minutes. Place the dough in a large bowl sprayed with cooking spray, and then cover with plastic wrap and sit in a warm place for approximately 50 to 55 minutes or until the dough has doubled in size. Preheat oven to 450 degrees. Line a large cookie sheet with parchment paper and spray lightly with cooking spray. Set aside. In a large pot, bring the 10 cups of water and the baking soda to a rolling boil. Place the dough onto a lightly oiled work surface. Divide into 8 equal pieces, and roll out each piece into about a 24-inch rope. Make a U-shape with the rope, holding the ends of the rope, cross them over each other and press onto the bottom of the U in order to form the shape of a pretzel. Place onto the baking sheet. Working one pretzel at a time, carefully place into the boiling water, and cook for 30 seconds. Remove from the water using a large flat spatula, and place on the baking sheet. Brush with the egg/water mixture and sprinkle with salt.